A party bus limo consists of a luxurious bus that has been transferred to a luxurious limousine bus, party bus limos or limousine party bus limos, however you want to call it, providing you and your friends with all the capabilities of a luxurious limousine ride. A party bus limo is perfect for many special occasions where you are able to hold many of your friends at one time. Now that you understand what value a party bus limousine in Toronto and surrounding areas brings to a night out, the next step is to choose the right limousine in Toronto and other areas we cover. While there are many different companies to choose from, the one that you can settle on is Paradise Toronto Limo that is the premier limousine service company in Toronto. 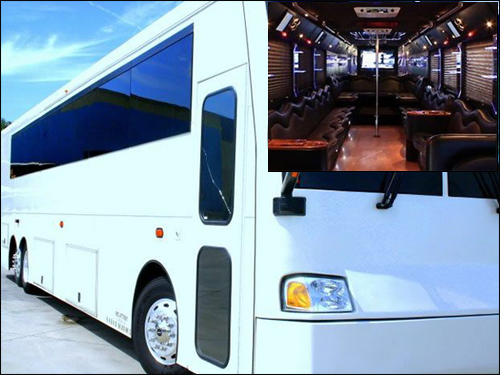 We have a nice selection of limousine buses and party bus limos to choose from. Some of the services that are great with a party bus limo include a wedding limousine, a prom limousine, a night out limousine ride, a casino limousine ride and more. We have different size party bus limos ranging from seating 20 passengers to 50 passengers, depending on your capacity needs. Call Paradise Toronto Limo today to book your party bus limousine in Toronto around the GTA. © Paradise Toronto Limo. All Rights Reserved.